Lifetime’s Tamarack Angler 100 is one of the best fishing kayak that most fishing-goers who also enjoy kayaking at the same time, can use with comfort and ease. We have stumbled across lots of Lifetime tamarack kayak reviews and was shocked by how others had highly-rated this model. Here is a quick recap on what we think of this kayak. Only comes in 1 color. In our review, we are going to mention how this sit-on-top fishing kayak had won many hearts, becoming one of the top seller compared to so many other brands available on the market today. Read along to find out the specs and features of this specific model. But before that, we think its better for you to know a little background behind this kayak's great manufacturer, the Lifetime. Lifetime was established in 1986. The ultimate goal of the company is to manufacture highly durable and long-lasting products, that’s how they named their company. They produce quality products that are very innovative and cool in nature. Not only limited to kayaks, but Lifetime also manufacture picnic tables, chairs, sheds, garden & patio furniture, basketball hoops and water activity gears. 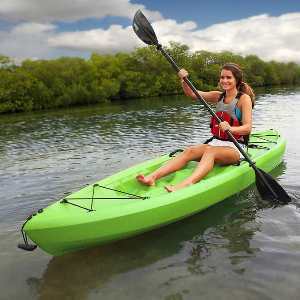 In the world of water activity gears, they make sit-on-top kayaks, fishing kayaks, paddle boards, youth paddle boards and of course, paddles and accessories. Their products are top notch, without any defect, very much reliable and fun to use. 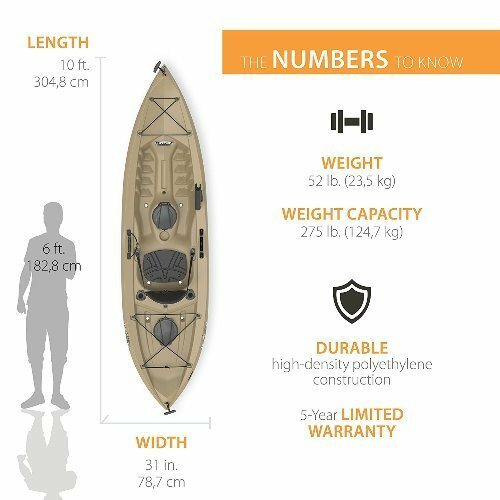 This kayak has a height of around 14.1 inches. So, you will have quite a bit of space between you and the water. It is 120 inches long, so you can easily fit even if you are taller than the average person. It is 31 inches broad in nature, which ensures that you have enough space to sit in. It weighs around 52 lb which makes it quite lighter and easier to carry around. Plus, this would also make it stress-free to store. This Lifetime kayak can hold up to 275 lb of weight capacity. So, you do not have to worry about cutting down on those hamburgers to buy this kayak. The hull is made of good sturdy material of high-density polythene. This makes it strong and tough enough that it will be hard to puncture, and can sustain the strong waves of the water bodies of this planet. This fishing kayak has a padded seat so to ensure your comfort during your journey. It has extra storage place beneath the deck, it has two extra hatches that you can put your gear in. What is a fishing kayak if it is without a fishing holder? This kayak has two flush mounted fishing holders in an arm’s reach so you do not have to worry about them. it also has one top mounted fishing rod holder. It also has two shock cord straps, in the front and the back. These are also used to store gear. It has multiple footrest positions to accommodate any size of paddlers that might use this fishing kayak, making it suitable for kids and adults both. It has T-handles in the front and rear of the kayak so you can carry and transport it anywhere you want with full ease and comfort. It is made of UV treated polythene material which is also a high-density material. This ensures that the kayak is strong and good enough for the waves. It has a flat bottom which makes sure that the kayak remains stable on the water and does not wobble too much. This kayak comes with a warranty of five years, this shows how reliable and durable this kayak is. It has paddle keeper attached to it so you can securely keep your paddles in a place where you can reach them easily whenever you want to. Well padded back rest. Provides firm back and body support. It has paddle and fish rod holders. It is light weight and has handles on the bow and stern making it easy to carry around. It is made of really feasible fabric, reliable and durable as ever. It would be safe from punctures due to the good quality material. Sand and water does not get in too much. It comes in only one boring color. It does not come with paddles, which means you will have to buy them separately. You might need a few accessories to enjoy the whole experience. Even though this is really light in weight, you would still feel more at ease if you got the universal kayak and canoe cart. It is two wheels that help you drag you kayak here and there without any difficulty. You cannot possibly row a kayak without the paddle. There are multiple type of paddles that you can get for your kayak. Lifetime brings Sup paddle, Aspire Sup paddle, Emotion Blackjack Kayak paddle, kayak paddle and Slingshot paddle. To keep your things safe from getting wet, you need the dry bags to put your stuff in. Before buying anything, you should always read what other people have to say about it, especially those who have used the product you are about to buy. This gives you a better idea of what the product will be like and you can expect from it accordingly. 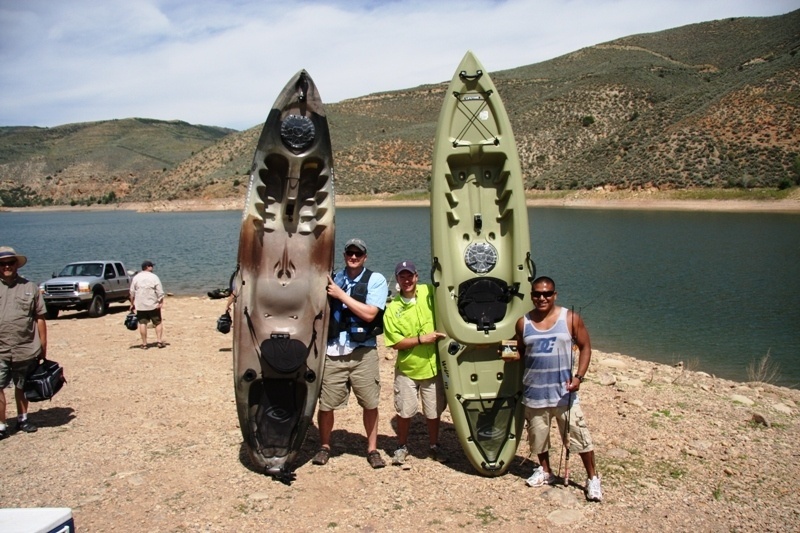 Lifetime’s tamarack angler kayak has had a lot of happy and satisfied customers. Most of the buyers gave the kayak a 5 star review. Around 87% of the people dubbed the product as more than satisfactory. People said that it is very stable on water as compared to other out there in the market. Some said that they felt like their money were well spent due to the great quality of the product. Very few people were unsatisfied with the kayak. However, there were 13% people had issues with the packaging of the kayak when it arrived. A few complained about the fishing kayak having a missing piece or cover. But all these issues had been quickly resolved. Other than that it has been declared as good product. * Check out our reviews on Best Fishing Kayak for the Money. By reading about the specs, features and the Lifetime tamarack kayak reviews, we are fairly certain that this fishing kayak is one of the best out there. It is durable, reliable, easy to use and very much handy. It is perfect for your next trip to any water body for fishing. We would rate this product a 4.8 stars out of 5. The reason we did not give it a 5 is due to it only coming in 1 color.